Mandalore is a militaristic dictatorship led by a council under the direction of Mand`alor Korlan Mereel and rules twelve sectors in the Colonies, Inner Rim, Expansion Region, and Outer Rim Territories. The Mandalorians adhere to a traditional system of Ranks and Clans which together with their military lifestyle of honor and discipline as their cultural keystone. As many as ten-thousand clans have risen and fallen over the long and tragic history of Mandalore, all tracing their origins to five ancestral clans in ancient times. Due to the political turmoil of the Second Era and the ever-growing unity of Mandalore's people, what were once numerous beyond reason have ultimately coalesced into twelve clans. Mandalore itself is the head of the Mandalorian military and governs the three industrial branches: MandalMining is responsible for prospecting, mining, and supplying raw materials; MandalMotors is responsible for the construction of Mandalore's fleet; and MandalTech produces all of its weaponry. The Mand`alor (which means "Sole Ruler" in Mando'a), or Warrior Eminence, rules over Mandalore, holding the respect and power over all Mandalorians. 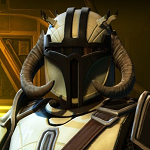 Within the core Mandalorian systems traditionally every citizen follows the warrior culture, and citizens of systems further away from the cultural core follow that way of life. Even those in what others might normally consider civilian occupations hold military rank as they are trained to fight. In the past, Mand'alor and his chiefs of the Army and Navy made up the Triad, which was responsible for passing of laws and making all the large decisions which effected Mandalore. The Triad has been challenged only twice in one thousand years, a fact reflecting the great esteem that was held for them. In recent times the Triad became the High Council, containing chiefs of the military and industrial aspects of the Mandalorian government. Complementing the authority of the High Council is a traditional clan system. In modern times, they form a cultural keystone and their governance is centralized in a Clan Council under the direction of Mand'alor. As many as 10,000 clans have risen and fallen over the long tragic and noble history of Mandalore, all tracing their beginnings to five original clans established immediately after the Crash. Due to the political turmoil of the Second Era and the ever-growing unity of Mandalore's people, what were once numerous beyond reason have ultimately coalesced into today's twelve clans. Mandalore itself is the head of the Mandalorian military and governs the three industrial branches, the Mandalcorps. MandalMining is responsible for prospection, mining and supplying raw materials. MandalMotors is responsible for construction of Mandalore's fleet, and MandalTech produces all of its weaponry. The Mandalore, one of the first human colony ships, was on its way to a recently charted system on the Rim when an on-board ship malfunction caused the ship to make the jump to hyperspace in the completely opposite direction of the path intended. The resulting crash landing left thousands of passengers stranded alone in an uncharted system that contained only one inhabitable planet. With no way to communicate their location back to those who might come to their aid, the colonists had to fight to survive. Over the many thousands of years of struggling to survive these strong people evolved into the culture now known as "Mandalorians", or Mando'ade in their native tongue of Mando'a. Initially humans, the Mandalorians continued to develop in their isolation, eventually coming into contact with an alien race that had never before been encountered. This race, which re-taught them the wonders of technology that had long been forgotten is now, sadly, extinct - victims to one of the many great conflicts that have challenged the Mando'ade in their blood-soak history. Over several thousand years the Mandalorians developed their own research facilities, the most productive outcome being their famous armor. Only the learned suspected their human past. Other races in the universe guessed the Mando natives were yet just another example of parallel evolution. Historically, Mandalore was isolated from the rest of the galaxy, at first physically and then later by an isolationistic tradition. At the end of a long age of conflict the Mandalorian population now includes numerous races from throughout known space and openly embraces immigrants from other cultures and species willing to adapt to Mandalore civilization. Today, the Abrion Sector of the Mandalorians is proudly as cosmopolitan as any other major galactic society. Mandalore was reborn in the Tau Sakar system in the latter part of year 5 (then known as the Abrion system). Unknown to the public, the lost Mandalore system had been relocated and colonised in secret. As the company was founded, its headquarters were erected on both Abrion Major and Mandalore, keeping the secret of Mandalore safe. The initial years were tough for the reborn group with veteran warriors Tyr DeMeer, Plo Qaan, Andrew Panzer and Vong Gin`aal leading the way. Others such as Vandar Nijed, Leos Adrynn, Chin Chon, Diomedes Nacca, Fitz Dantilles and Hermes Gemini began their personal rise to prominence as well. 2 years after the initial founding the first major colonisation in Abrion space took place to fund the restoration activity. Other hidden systems were located and secretly colonised by relocated refugees from the galactic wars. It was at this time that a new generation of veterans began to appear who would lead the Mandalore group through the beginning years and into ascendancy. Mandalorians such as Morcha Drayson, Tuki Anvareth, Cesodevo Avina, Verdre To, Grevendar Togl, Ven Ann, Lucas Draven and many more joined the effort to re-establish Mandalore. In Year 7 Abrion Minor was fully colonised as the Mandalorian refugees hear the call to return. It was at this time that the clans of Mandalore were re-convened by direct order of the Warrior Eminence, Mand'alor Tyr DeMeer. 12 clans, the only ones remaining, were brought together in unity to work towards the betterment of Mandalore (for more information about the Clans and their development please see below). Over the years, Mandalore built up its forces and exchanged its technologies, preparing for full rearmament. This culminated in the great revenge plot that brought the NAO (now the Anzatan Commonwealth) to its' knees in vengeance against the tyrannical dictator Wilhelm von Ismay. After prolonged scout missions a small cluster of planets as found close to the capital of Anzat. Here Mandalorian forces shepherded refugees and settled them in new colonies until their numbers outweighed those of the Anzatan worlds. Positioning their forces to strike, Mandalore revealed their new strike location and were instantly elected Sector Government. With official authority the Mand'alor ordered his forces to strike. As supercommando detachments descended upon the asteroids of the Anzat system, hundreds of drop ships invaded the capital of Anzat, arresting any senior Anzatan leaders for trial and conviction at a later date. Several months of deadlock passed with the NAO on the brink of collapse, only to have the New Anzat Order assassinate their own leader. With the despot Von Ismay removed, Chancellor Vong Gin'aal signed a peace treaty within one standard month restoring peace to the once enemy held territory. Previously, Mandalore was a member of the Imperial Union, an official alignment of great powers in the ongoing Second Galactic Civil War against the Galactic Alliance. Following the partial dissolution of the Union on Year 13 Day 300 due to internal dissent regarding a new charter, Mandalore joined the Galactic Concordiate, the largest alliance of neutral powers in the galaxy, on Year 14 Day 104. In Year 16 Day 121, Tyr DeMeer was succeeded by Andrew Panzer as the new Mand'alor. One year later Andrew Panzer abdicated the mask of the Warrior Eminence to Korlan Mereel. The clan system was lost for decades until Year 8 when two ambitious and committed Mandalorians launched a project to officially re-establish the clans under Manda'lor Tyr DeMeer. Verdre To and Morcha Drayson were these Mandalorians, who, working together with the Triad, finally succeeded. Today, twelve Clans stand to support the Manda'lor while others support Kai Oryk. A Clan Council composed of Aliit'buire (clan leaders) and run by a clan council chairman, known as the Aliit`jorad (Clan's Voice) is in existence, holding responsibility for the advancement and societal unity of the clans. The Aliit`jador is responsible for the smooth running of the clans and inter-clan co-ordination. He is also the Keeper of the Law of the Clans and as such helps out during leadership successions etc. The current Aliit'jorad is Shaa Cideg. Family is of primary importance to Mandalorians, marriages are conducted privately with the traditional exchange of vows being: "Mhi solus tome, mhi solus dar'tome, mhi me'dinui an, mhi ba'juri verde. "-which tranlates to "We are one when together, we are one when parted, we share all, we will raise warriors." The party that comes after the ceremony is often a public celebration with friends and comrades. Marital indescretions are generally forgiven in the case of long seperations, provided any resulting children are raised by the couple. As an equal but alternate consideration to biological offspring, adoption is very popular amongst Mandalorians and is carried out even amongst adults with the following vow given from parent to child: "Ni kyr'tayl gai sa'ad. "-meaning "I know your name as my child." Mandalorians do not mark any difference between biological and adopted offspring. Surprising many outsiders, Mando warrior culture does not recognize saluting during everyday military interaction. A simple nod of respect is all that is required when encountering a superior officer; the only exception being during designated formal events, when an official salute is preferred. Due to the fact that citizens of Mandalore who commit any kind of criminal action were traditionally put to death, the crime rate of the Mandalorian people is almost non-existent. Today punishments are less severe and the low crime rate is more a mark of respect towards their leaders and the trust they place in them.